The T-Priv by SMOK is widely known thanks to its innovative color scheme on the body and exotic light-show intertwined. Packing a massive 220 watts of power, and more importantly, combined with one of the best vape tanks to date - this T-Priv kit is rock solid. At first glance, it's already clear that the T-Priv is one hell of a looker. Featuring a high-quality paint finish that feels far superior to the paint job done on its predecessor the Alien 220. Previous complaints about the Alien always mentioned Smok’s poor quality paint which would easily chip flake even when taking utmost care of the device. This is a thing of the past for the T-Priv, the finish is beautiful and it’s there to last. It’s also great to see that Smok matches the color of the included Baby Beast tank to the mod itself giving it an attractive uniform look. The aesthetics of the T-Priv itself takes inspiration from the futuristic renditions of the Transformers movies, sporting an aggressive design highlighted with bright LED lights which give the mod a “living machine” feel. It’s definitely a unique motif that lets it stand out amongst a crowd of mods with very same and dull designs. The dimensions of the T-Priv measure out to 86.6 * 48.1 * 32 mm (H*L*W), essentially making it a mid-sized device. In contrast to the Alien 220, the T-Priv is quite boxy which accentuates its modern styling even more. Despite its box-like shape, it rarely feels uncomfortable and while it’s admittedly not as ergonomic as the Alien 220, holding and using the device is still a great experience especially for those who prefer the T-Priv’s bold design. One of the features of the T-Priv that make it such an attractive device is the implementation of the customizable LED lights strewn across the exterior. The LED’s can be configured to display a multitude of colors in various lighting modes. The lights can be set to turn on only when the mod is fired, or stay on all the time, depending on your preference. Although the LED’s are quite bright, I’ve never found them to detract from the overall battery life of the mod thankfully. Smok staying true to their design language implemented a firing bar on the side of the device, making actual usage of the device comfortable and intuitive. Pressing the firing bar offers a satisfying clicky tactile response and never feels mushy. 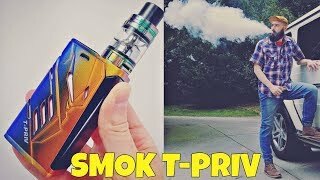 Unlike some of Smok’s older devices, the firing bar on the T-Priv is solid and doesn’t rattle at all, a definite improvement which I hope to see continue in their devices to come. The OLED screen which displays all the information can be found on the top of the T-Priv next to the 510 pin. I’m quite a fan of the placement as it lets me monitor how the mod is running as I’m using it without requiring me to peer over the side of the device. The stainless steel spring loaded 510 connection feels sturdy and connects very well with the Baby Beast tank without any issue. Threads are well machined as well, so you won't have any issues screwing the tank on. The T-Priv uses a trapdoor mechanism to access the dual 18650 batteries found at the bottom of the mod. It’s easy to open and close, feels sturdy without any wobble, and properly indicates how batteries should be installed, making quick battery swaps a breeze when using the mod on the go. Based on aesthetics alone, the T-Priv definitely has much more to offer over other similarly sized dual battery mods, and anyone who’s a fan of its futuristic approach will instantly gravitate towards it’s bold and beautiful finish especially, when the lights are out and the T-Priv gets to show its true colors thanks to the LED lights. Smok packaged the kit to contain everything you’ll need to start vaping right away, bar the actual liquid and 2 18650 batteries. The kit comes packaged with Smok’s famous Baby Beast sub-ohm tank, 2 coil heads: one 0.4-ohm dual coil head that comes pre-installed and a 0.15-ohm octuple coil head. Also included in the box is a replacement glass tube for the tank just in case the original should break, a micro USB cable which can be used to charge the device or deliver firmware upgrades, the standard user manual, a few protective vape bands that fit around the glass tank to protect it from falls or drops, and some spare o-rings. Over time the Baby Beast tank has proven itself a reliable and well-performing sub-ohm tank, offering outstanding flavor reproduction and vapor density. The included Baby Beast works very well in tandem with the T-Priv, thanks to the multiple coil configurations that it supports paired with the raw horsepower the mod itself can supply to the tank. The tank holds up to a maximum of 5ml of liquid making frequent refills a non-issue. The top-fill sliding mechanism ensures that refilling the tank with liquid is easily done, even when on the go. Unlike the multitude of other sub-ohm tanks in the market, the Baby Beast is quite resistant to leaking, even when using high PG liquid I’ve yet to experience any leaks from this tank. Airflow on the Baby Beast is widely adjustable allowing you to get that perfect ratio of airflow and vapor density suited to your needs. Using the tank, whether set for maximum airflow or for restricted draws, never feels turbulent or whistle-y, a common problem plagued by other tanks in the market. The T-Priv supports temperature control across the entire line of TC coils available such as stainless steel, nickel, and titanium as well as a pre-heat function for those who prefer to vape at wattage mode, basically everything an advanced user needs in order to dial down their vaping experience to just how you want it. The settings are easy to configure thanks to the intuitive menu navigation and informative screen. Battery life is also exemplary thanks to the dual 18650 batteries which guarantee you’ll be vaping all day without the need for a recharge midway. The LED lights never feel like it's draining the battery probably except for if you set them to be always turned on even when not using the device. The T-Priv is a solid and well-constructed device that pushes the envelope on design with its fresh and futuristic look that’s sure to appeal to fans of the genre. Even if you aren't wowed by its aesthetics, the mod still has a lot to offer with its reliable and solid performance, stellar battery life, a host of easily configurable vaping modes, and the Baby Beast that comes with the kit that’s sure to knock your socks off with its intense flavor and vapor density.